People aren't fond of anything that can harm them and what I've found around here is people hate the one venomous snake in our area. 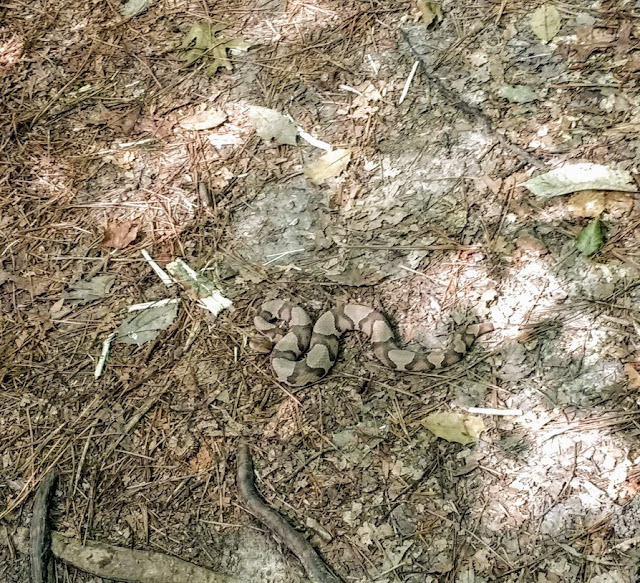 It's called a copperhead and as much as I've fished, mtn biked, and hiked I've only seen 2 in the wild. I'm sure I have went buy them many times and not noticed. I also don't get too curious when I hear noises of something moving through dry leaves. If it leaves me alone I do the same. I came across this little guy over the weekend while riding my mtn bike. The bike went right over the snake and I raised my legs up and tried not to run it over. 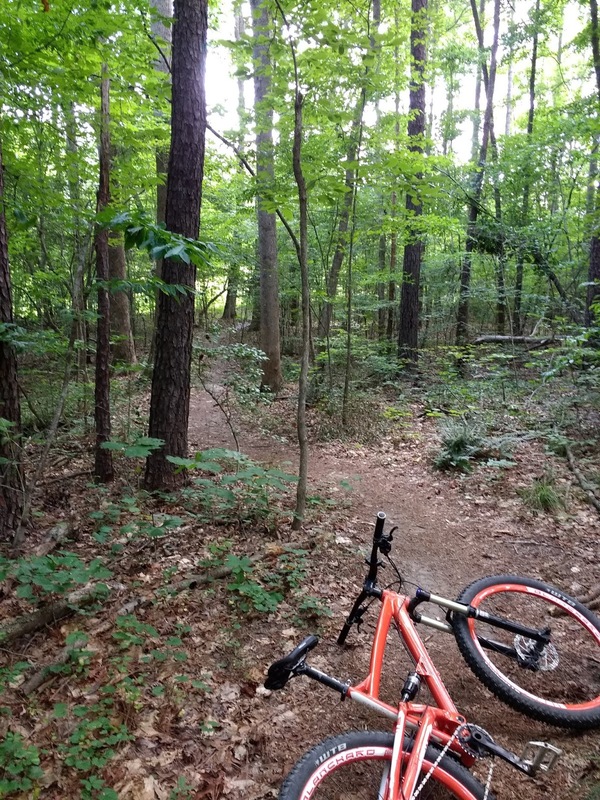 The snake was right in the middle of the trail and I stopped to warn anyone else coming behind me but also to possibly move the snake. You can see from its body positioning it wasn't super happy. The coloring on these snakes is beautiful. I rarely ever see them so when I do I feel it's special and I'm always amazed at how pretty they are. I started hunting around for a stick to move the copperhead and took great caution to make sure I didn't run into another snake. 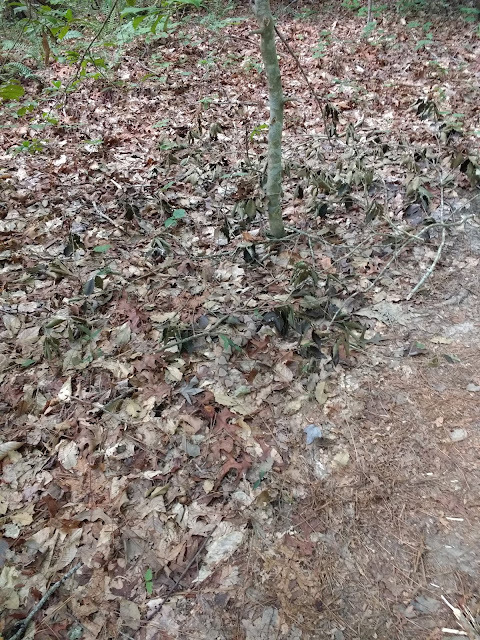 This next picture is after the snake was moved from the trail the snake is in the picture, you can see how hard it is to see them in this habitat. The copperhead wasn't aggressive at all when I moved it. These snakes get a bad wrap because they are so feared. They really are special creatures and should be admired. Not having something to hit the lakes around here is really starting to annoy me. I'm trying to decide if I want something the family can enjoy or just something for myself. The thought of a john boat is intriguing but I really have no place to store it and don't want to deal with a trailer and the engine maintenance. Inflatable boats have caught my eye and some seem to do quite nicely with just a trolling motor. There's one in particular called the Intex 4 and there are forums posts all over of people tricking these boats out. 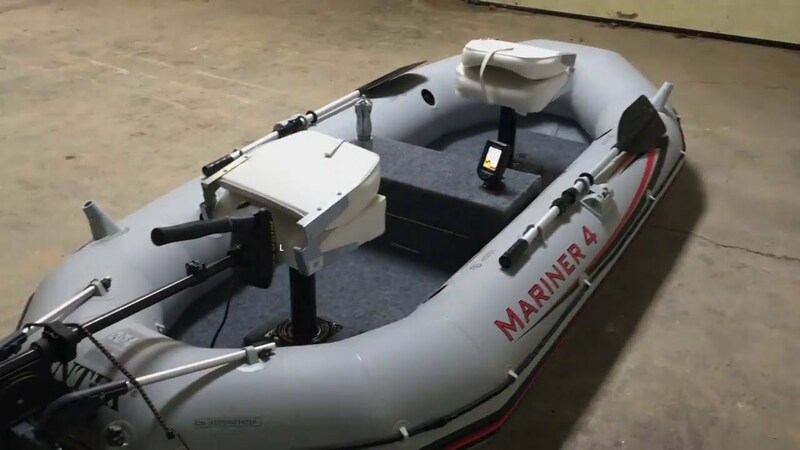 This kind of setup is a decent investment some where around $500 which is a pretty decent value for a transportable boat that can hold a family of four and has a motor. Both have decent reviews but to be honest I'm over loading stuff on my car. I did it with my Native and it was doable but I can't say I enjoyed it after a day on the water. I'm leaning towards the inflatable boat and installing a wood floor to go inside of it. We'll see what happens I may end up not getting anything. It's fun to shop but it would be more fun to use one of these boats out on the water. I haven't been fishing in awhile. We've had a real heat wave lately with 100+ heat index and horrible humidity.